Québec Premier Francois Legault, left, exchanges hockey jerseys with Ontario Premier Doug Ford at Queens Park, in Toronto on Nov. 19, 2018. Ford’s recent cuts to francophone services in Ontario haven’t spawned nearly the media outrage that Québec language moves have. Don’t get me wrong: It’s always nice to see folks in Ontario and the rest of English-speaking Canada say a few words in support of the English-speaking minority here in Québec. But there are far more endangered, far more precarious, French-speaking minorities in Ontario, New Brunswick, Saskatchewan and all nine majority-English provinces. In fact, those minority groups — English-speaking in Québec and French-speaking in the rest of Canada — are what make this country what it is. There is a huge amount of work still to do on recognizing Indigenous rights and fostering Indigenous languages, of course. Important work is happening on that front, though the country has a long way to go. Maybe it’s time to declare Indigenous languages to be official languages. In the meantime, however, it’s worth protecting the minority official language communities. But to read leading English-Canadian media, you would think that only one of those communities — Québec’s anglophones — were under threat. Take the Globe and Mail, the country’s national newspaper. When Ontario Premier Doug Ford recently slashed services to Ontario francophones and axed plans for the province’s first French-language university, the Globe ran a total of five articles by Nov. 21, according to a search of the Canadian Newsstream database. The Buonanotte restaurant, at the heart of the ‘pastagate’ uproar, is shown in Montréal in February 2013. This sort of hyperbole is too common in the English-Canadian press. The Globe has so far issued no editorials against the Ford cuts to francophone services — though it did run an opinion piece in support of Ford’s move written by the president of Trent University. The Globe, of course, should not be singled out. A Postmedia editorial published in the Ottawa Citizen and other newspapers, called the loss of the position of French Language Services Commissioner “unfortunate” in the eighth paragraph of a nine-paragraph editorial. Otherwise, the newspaper database finds no editorial comment of any sort — let alone the sort of scathing denunciation that descends when Québec’s language laws make headlines in English. “Pastagate” was mentioned 311 times in the Canadian Newsstream index in 2013, the year it made headlines; Ontario francophone services rate 96 mentions since Ford’s cuts were announced. In some ways, Québec language policy serves as an “external enemy” for English-speaking media. Mocking the periodic outbreaks of Québec language-law foolishness sells papers — or in digital terms, poking fun at pastagate is great clickbait. Criticizing the powerful in Ontario when they attack minorities does not produce the same results. Let’s not forget, however, that Québec’s anglophone community has spawned three universities, and that the Québec government has made no moves to shut down these minority-language universities — in fact, a revision to Québec’s university funding formula this year helped Bishop’s University in the Eastern Townships, where I teach history, more than any other institution in Québec. Québec’s anglophones have fought to protect their institutions. When the previous government led by Philippe Couillard announced plans to amalgamate school boards, the English-speaking community mobilized to save English-language school boards, successfully. It may need to fight the same battle in the face of renewed plans by the new government under François Legault to shutter local school boards. Given this history, it’s no surprise that the Townshippers’ Association announced its “solidarity with our French-speaking counterparts in Ontario” as they mobilize to defend their own institutions and protect recent gains. This is part of a renewed attack on the French in Canada by the rising populist right, exemplified by Ford’s Ontario government and the New Brunswick’s People’s Alliance, which props up the incoming New Brunswick Conservative government. Anti-Francophone sentiment is nothing new in Canada, as University of Guelph historian Matthew Hayday has written. But it seems to be on the rise — and that will only empower those in Québec, chastened by recent declines in their public support, who might want to crack down on the anglophone minority. Somehow, a study of low-level war between Indonesia and Malaysia in the 1960s has led me to reading about the history of fisheries cooperatives in Quebec’s Gaspe Peninsula. My first book was a relatively straightforward diplomatic history of Canada’s relations with Indonesia, mostly dealing with the years from 1945 to 1965. My research for it left some (to me, at least) intriguing gaps. A short reference to the “wonderful zealot” Louis Bérubé being brought in as part of Canada’s efforts to defend a Malaysian federation founded in 1963 led me to wonder where this “zealot” came from. Why was a Quebec technical advisor working with Malay fishermen considered to be part of a defence effort? Chasing connections down archival avenues in Ottawa and Rimouski leads to some lessons about Canadian social democracy overseas. Image: Louis Berubé, Rapport de Mission d’Enquête au Cambodge, 1956. Université du Québec à Rimouski archives, fonds Louis Bérubé, box 7 (2e versement), dossier 160. Louis Bérubé was in Malaysia as part of his third Asian posting as a technical advisor. The focus in studies of the history of development, and technical assistance in particular, has been on the United States government trying to re-invent the world in its own image, through modernization theory in particular. That focus is not wrong, of course, but it’s important to see the role of non-American agencies, such as the Commonwealth’s Colombo Plan and the UN’s Technical Assistance Administration, and the ways in which these other agencies differed in their approaches and personnel from the better-financed American technical cooperation programme. A key difference was that the TAA, especially, was dominated not by American New Deal liberals, but by social democrats – many of them Canadians. Bérubé was one of these men. One Canadian diplomat’s memoir calls him “a wonderful zealot from Quebec [who] preach[ed] the cooperative movement gospel that fishermen could largely control their own destiny if they worked together to catch and market their own produce.” This cooperative gospel was born from Bérubé’s work in the hardscrabble fishing villages of Quebec’s Lower Saint Lawrence and Gaspé regions and then simmered in his fisheries advising career in Asia. In Cambodia, Ceylon, and finally Malaysia, he advocated organizing fishers into co-operatives, creating credit co-operatives that could lend them the capital they needed to escape the clutch of rapacious traders, and capping it with marketing expertise to make sure that fish would find willing buyers, whether domestically or internationally. Bérubé’s work was to spread the pre-1945 successes of cooperatives in Quebec to the post-1945 global South, and he sold this in Ottawa as the best way to defeat the communist threat. Recommendations painted in some cases as unfair infringements in capitalist markets were reasonable, he convinced many, because poor fishermen (and by implication, others living in poverty) could resist the siren call of communism only if offered the tools of co-operatives. In making this point, Bérubé hearkened back again and again to his home region. Born in the last years of the nineteenth century in Ste. Anne-de-la-Pocatière, a village in Quebec’s Lower Saint Lawrence region, Louis Bérubé preached the co-operative gospel from an early age, beginning with a successful effort to build a cooperative among fishermen at Cap-des-Rosiers, at the tip of the Gaspé peninsula. Quebec fishers lacked access to credit and markets, controlled respectively by banks and fish trading companies based in larger cities. So they had to build credit, expand markets, and diversify from salted to fresh and frozen fish in order to up fishermen’s incomes. Bérubé from the 1930s onwards stressed technical training of fishers and cooperative education. One outgrowth of this was the creation in 1938 of the École des Pêcheries at Ste. Anne-de-la-Pocatière, affiliated with Laval University. Bérubé’s experience as the school’s head of economics officials in Ottawa to invite Bérubé to advise on a request for fisheries assistance from Cambodia received in 1955. Bérubé also preached modernization. He ended his final report to the Cambodian government by worrying that it was the “messe de petits pêcheurs familiaux qui paralyse le développement des pêcheries.” They had to be brought swiftly into more modern methods to allow development to go ahead. Poor Cambodian fishermen, he wrote, stood in the same position as had 1840s weavers in the English town of Rochdale, birthplace of the global cooperative movement. They, too, could organize themselves. The thread of cooperatives first spun in Rochdale and picked up around the world, including in Gaspé, was just as applicable in 1950s Cambodia. Cooperative education and organization had succeeded in Quebec, he concluded. “It can do the same here. And it must do it.” Here was a social-democratic vision: cooperative organization as a path towards social justice that at the same time served the twin goals of modernization and anti-communism. Why does all this matter? Bérubé saw models at home that could be applied in Asia, and preached them as a virtual “gospel” on the other side of the Pacific. Many in Asia welcomed this sort of technical assistance. Berubé’s thoughts, born of a Quebec Catholic social justice tradition, spawned models for Asian contexts. Studies of advisors like him add to the growing sense that Quebec prior to the Quiet Revolution was far from inward-looking, but was highly engaged across borders. Thanks to Sarah Zwierzchowski for research assistance. 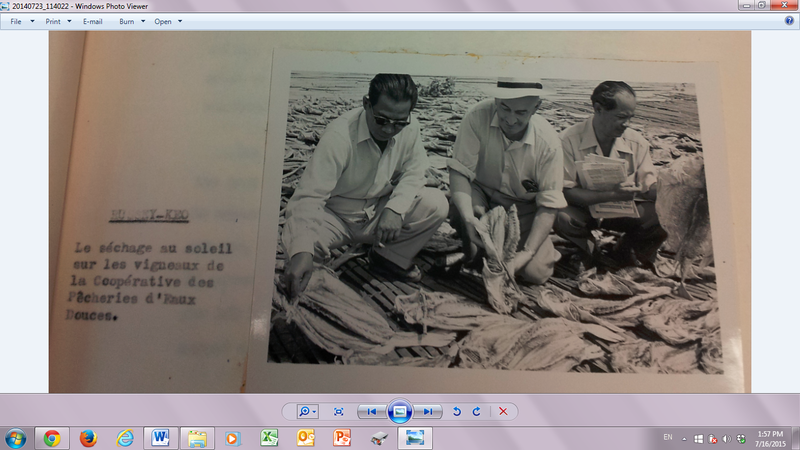 Berubé’s story comes through in files in Library and Archives Canada files on technical assistance (RG 25, External Affairs, and RG 74, Canadian International Development Agency) and in his own papers housed at the Université du Québec à Rimouski. This study forms part of a future book project entitled Modern Missionaries: Canadian development advisors in Southeast Asia, 1945-65. It draws on a paper presented at the 2015 Canadian Historical Association annual meeting. Earl Drake, A Stubble-Jumper in Striped Pants, 71. “Co-operative Organization of Fishermen,” Bérubé’s progress report #3 to Colombo Plan administration in Canada , LAC, RG74, vol. 258, file 36-8C-B10. « Projet de stabilisation et d’expansion du mouvement coopérative chez les pêcheurs du Cambodge, » Bérubé report to Cambodian minister of finance Mau Say, 1 May 1956. “Co-operative Organization of Fishermen,” Bérubé’s progress report #3 to Colombo Plan administration in Canada ; LAC, RG74, vol. 258, file 36-8C-B10. Vérité et Réconciliation en Asie du Sud-Est: quelles leçons pour le Canada ?